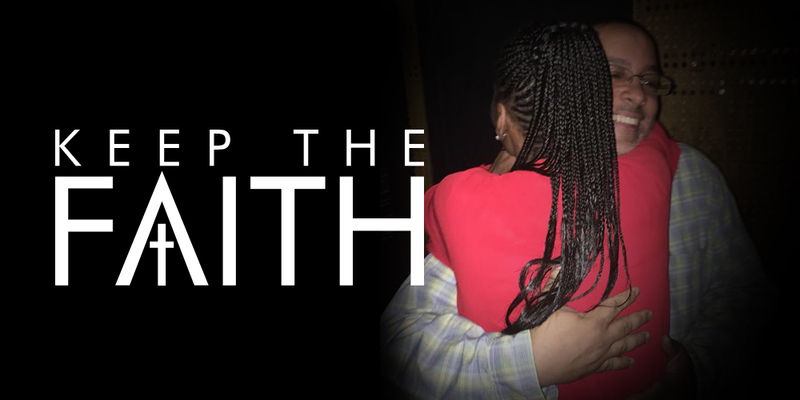 I created a design called “keep the faith”. When I made the design, I was in the midst of one of life’s turbulent times. As I was dealing with the moment at hand, the phrase”keep the faith” came to my mind. I repeated it to myself over and over. Shortly after, ideas and visions started forming in my mind, so with pencil in hand, I started doodling the phrase over and over. As I was looking at the sheet filled with various scribbling, there was a spot on the paper that I hadn’t filled. At the time, I hadn’t noticed it but now as I write this, I realize that the sheet of paper, with all it’s “noise”, represented life at the moment for me. The sheet of paper also provided a place for me to regroup. As I looked at this blank spot, I filled it with what would be my design “keep the faith”. About 2 weeks ago, I attended an event for one of my favorite people on this planet, Dr.[what! ], Nadia Lopez. While at the event, Nadia formally introduced me to her friend Dianne. We shook hands and said hello. There was a pause as she looked at me then Nadia said “YOUR SHIRT”. This woman hugged me like you wouldn’t believe. As she embraced me she spoke into my ear however it was more into my soul as she expressed her gratitude for what I had created and done for her. You see Nadia bought Diane my “Keep the Faith” shirt as a gift. At the time she mentioned she was buying it for a good friend of hers. I didn’t know Diane was fighting cancer. I was surprised to receive her “thank you” via text message last year. It was a big deal for me then, but standing here face to face was beyond anything I could have ever expected. I was not expecting this to happen, this moment in life which I will never forget. It may seem insignificant compared to everything that life has coming for me but this was one of the most proudest moments of my life. The moment when someone you don’t know, probably would have never met because your paths would more than likely never cross, tells you how much you helped them through your gift and they are so appreciative for it and they appreciate you. All I can say is I am so blessed. I wasn’t going to attend the event, but something inside told me I had to go. I am still in awe of how it all happened.